Traditional packaging of barbecue ribs for retailers and consumer preferences for a fuss-free cooking and cleaning have resulted to a packaging that cooks in the oven and on the grill. Food News International spoke to Miguel Campos, export sales manager at aluminum packaging supplier Advanta, to find out how new packaging concepts have met today’s demand for convenience and food hygiene. FNI: What was the packaging situation before the aluminum rib tray launch? Campos: The growing market for barbecue ribs has driven the need for a convenient and fuss-free packaging alternative. Consumers today do not want to be handling meat, clearing up messes and washing up oven-baked trays. Instead, they needed something that they can cook and serve a barbecue rib meal in one strong and functional tray. To meet this requirement, Advanta launched the new barbecue rib smoothwall tray, an aluminum packaging option that is compatible with vacuum packing. The tray has been pressed specifically to match the curves of the ribs, ensuring the ribs are positioned steadily, ready for vacuum sealing and transit. The product is the first of its kind to market, providing a fuss-free alternative to barbecue rib ready meals. FNI: How did the tray and design concepts come about? Campos: One of our customers manufactures a brand of rib ready meals in the US. 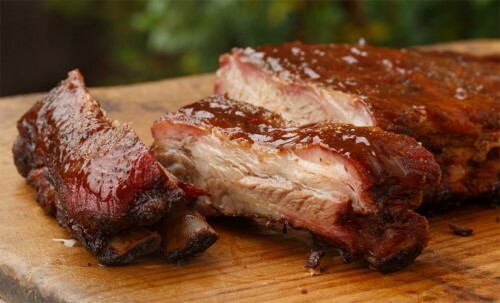 The company initially used plastic packaging to contain the ribs in a bag, but quickly received feedback that this was messy for the consumer. Using this method, the consumer was required to empty the contents into an oven-safe tray prior to cooking. The feedback stated that plastic bag packaging caused accidental spillages, and often left much of the product stuck inside the bag. To solve this problem, Advanta began looking for an aluminum alternative. Working closely with this customer, Advanta produced a specially shaped aluminum tray, complete with plastic vacuum sealing to lock in the barbecue flavor. To prepare, the consumer peels back the plastic vacuum-packed film and puts the aluminum tray into the oven for 15 minutes. Due to the high temperature resistance of aluminum, the product can be stored, cooked and even served in the same packaging. Using an aluminum tray, the product can be placed directly on the barbecue grill, so customers can still use the ribs for traditional barbecue-style cooking, without the usual mess and cleaning. FNI: What challenges did the designers overcome when developing the tray? Campos: Shape was the primary concern, as we did not have a standard aluminum tray template to fit these ribs initially. As an alternative, our designers began developing custom 15, 17 and 19 inch smoothwall aluminum trays for this product. Emulating the rib shape was new territory for this particular tray size. The design team had to ensure the ribs were positioned steadily in the tray, ready for vacuum sealing and transit. Most importantly, the tray had to enable an air tight seal for the product, otherwise the vacuum packing efforts would be wasted. Product testing proved that the curved elements of the tray were compatible with vacuum packing, validating the design and making the new product launch possible. FNI: How can food manufacturers incorporate the tray in their factories? Campos: For rib meal manufacturers, it depends on their existing equipment. Food businesses across the world are transitioning away from plastic, using our smoothwall equivalents to plastic trays guide. Incorporating the new barbecue rib smoothwall tray in a factory should not be a difficult transition for tray sealing machines with the skin pack option already installed, but the Advanta team is happy to discuss this further on a case by case basis. Additionally, some existing vacuum packaging systems should be compatible with this tray, further simplifying the transition to this new packaging type. FNI: How did Advanta spot market opportunities for the tray? Where would the company like to supply this packaging concept to in 2019? Campos: This style of cooking is popular all over the world. For Advanta, this concept has sparked huge interest in the US, but that is not to say other countries are not spotting the potential in this packaging either. Wherever you are in the world, businesses are feeling more pressure to provide consumers with convenience and sustainability. By switching out the bulk of this packaging with aluminum, huge volumes of plastic can be prevented from reaching landfill. FNI: How will this concept develop to serve other applications of food storage and preparation? Campos: Interestingly, since the launch of the new rib packaging, the combination of vacuum pack and aluminum trays is becoming popular in other food divisions. Poultry is a great example of this. Like pork rib meals, whole poultry has been traditionally packaged in plastic trays or bags. As more consumers today prefer not to touch raw poultry, Advanta saw a gap in the market for an aluminum alternative whereby the consumer peels away the skin pack film and puts the tray straight into the oven. We have since launched the poultry vacuum pack smoothwall tray, which has resulted in global interest from food manufactures. Whichever food type aluminum packaging is used for, the drivers will always be convenience and sustainability. It is likely that more brands will turn to the aluminum tray and vacuum pack combination in the future, to overcome consumer pressures for plastic alternatives and fuss-free cooking.